As with most East Anglian towns and cities, the railway station in Norwich was built outside of the immediate centre because its main use was not for passengers, but for goods, especially livestock, which needed space to be penned nearby until the time for their journey began. There was another station on a different line closer to the city centre, but it is Thorpe station that has survived. 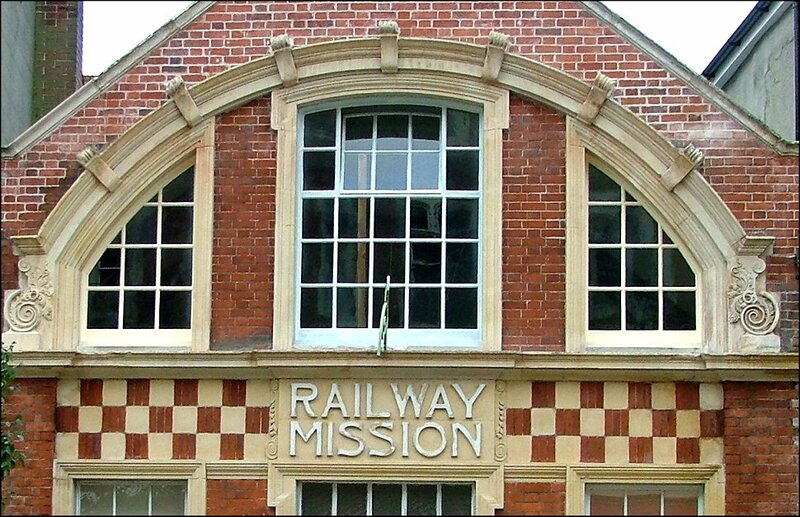 As in Cambridge and Ipswich, where the main station was similarly placed for the same reason, the area became home to dozens of rows of terraced houses, for workers on the railway and in the industries that the presence of the line generated. Although the Church of England was not slow to respond to what it saw as the pastoral needs of these workers, there were plenty of other denominations elbowing for their attention. For a start, many incomers were Catholics, and it was in the 19th century that the Catholic population of the city ballooned. But it was also the time that the congregational chapels took off, and although many of them have fallen prey to demolition in recent decades, there are some interesting survivals, including this little Railway Mission chapel of the 1890s with its Art Nouveau frontage. Prince of Wales Road, like Princes Street in Ipswich, was built specifically to connect the railway station with the heart of the town, and still today this chapel is a familiar sight for pedestrians en route between one and the other. Happily, it is still in use for its original purpose; as the Prince of Wales Road Evangelical Church, it maintains two services every Sunday.